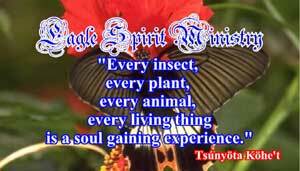 Eagle Spirit Ministry is a Gypsy or travelling Ministry. We have no permanent base, but operate wherever we happen to be at any time. We do have limited administration offices in Sydney, Australia. 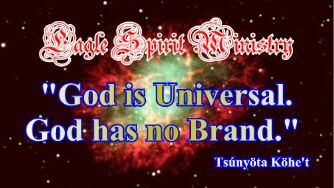 Eagle Spirit Ministry is a Universal Ministry based on an acceptance that God is all that is. 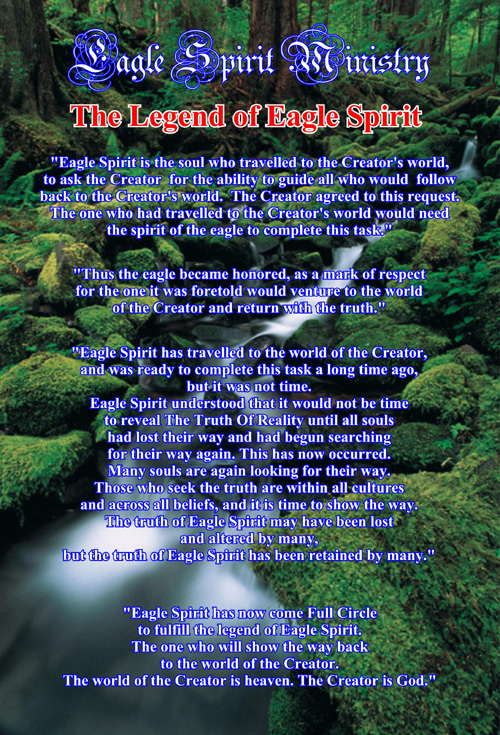 Eagle Spirit Ministry accepts all belief systems, which means that we are not limited by philosophy or religion. God is universal or all that is, and as soon as we set parameters of guidelines, we place limits on God who must be, by definition, without limit. There are as many paths to heaven or the higher plane, as there are individual souls, because each soul must follow their own path. As such Eagle Spirit Ministry does not have a predetermined dogma which must be followed, but acts as a catalyst to provide a wide range of resources, which any may review as they are drawn to review. Eagle Spirit Ministry also makes the works of Tsúnyöta Köhe't available, as an example for all who feel drawn to the example of Tsúnyöta Köhe't. As to which texts may be 'right' for each individual, can only be determined by each individual. It is not the place of any religious or other organisation to arbitrarily decide which spiritual text is truth, and which is spiritual text false. As soon as we place limits on truth, we are placing limits on God, because God is truth, and God is infinite. Eagle Spirit Ministry is a teaching Ministry, through creating an environment for those who are ready to learn, at their own pace, and in the manner which they are comfortable with. Spirituality, and existence is not hierarchical or linear in nature, but circular. There are no advanced souls, only souls experiencing whatever existence they have chosen to experience. The only correct method to determine what has chosen to be experienced, is self determination. Eagle Spirit Ministry undertakes spiritual activity on a number of levels. 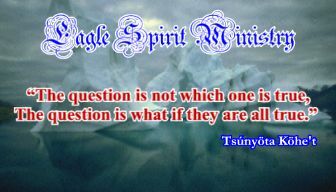 However Eagle Spirit Ministry does not 'preach' and Eagle Spirit Ministry does not force its truth on others. 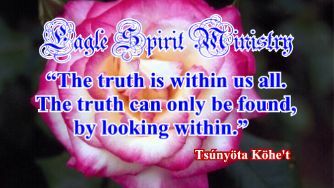 Eagle Spirit Ministry does make the truth available for any who are seeking. 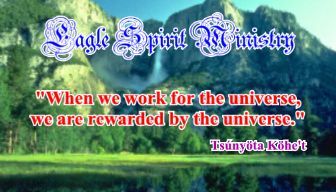 The spiritual activity of Eagle Spirit Ministry is undertaken across all planes of existence. Eagle Spirit Ministry allows itself to be drawn to where Eagle Spirit Ministry is needed, and to perform whatever task is required of Eagle Spirit Ministry without preconceived ideas. 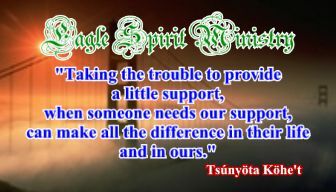 The work of Eagle Spirit Ministry often involves providing practical assistance, or guidance to those we encounter on our travels. We have long ago abandoned any preconceived ideas which we may have in respect of the nature of the assistance, which we are required to provide. We have also learned that we cannot anticipate who we may required to assist and why. Often Eagle Spirit Ministry will not know what our task is, until after our task has been completed. When Eagle Spirit Ministry is drawn to be somewhere, Eagle Spirit Ministry may stay a lifetime, or Eagle Spirit Ministry may stay a moment. 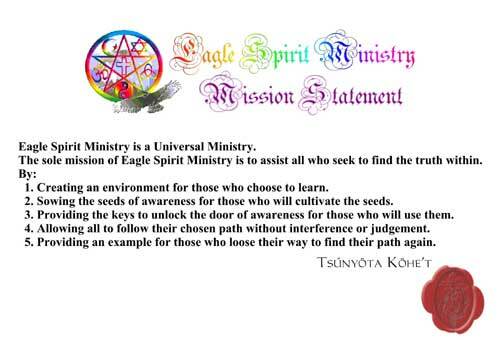 Eagle Spirit Ministry does not accept payment in any form for its spiritual activity. Eagle Spirit Ministry does not accept monetary donations, but Eagle Spirit Ministry will accept bequeaths. Eagle Spirit Ministry does not accept donations, because it is too easy to become distracted by a desire to raise money regardless of how pure the motives, and sadly in some instances allow the ministry itself to become more important, than the work of the ministry. Organisations such as the Salvation Army do wonderful work, it is far more beneficial to encourage support of such organisations, than to establish ourselves as a competing charity. There have been a number of people who have insisted on making donations to Eagle Spirit Ministry, and have sent unsolicited payments to us. If anybody does particularly feel that they need to make a donation to Eagle Spirit Ministry, we suggest that you do so by purchasing a book or a series of books perhaps for your family and friends from our bookshop. True spiritual teaching, regardless of the physical source, is a gift from God, irrespective of the label and interpretation which is applied to God. True spiritual knowledge is a gift from God and true spiritual knowledge is priceless. True spiritual teaching, cannot be sold, true spiritual teaching must be freely given and shared. We may have to pay to cover the physical cost of a book, for example, but we can freely access true spiritual knowledge on the internet, or via a Priest, Monk, Cleric, Wiccan and so on. If we are offered secret or hidden knowledge for a large amount of money, what we are being offered is not spiritual knowledge.